There are three possible outcomes if the institutions in the North don’t get up and running soon, said Clinton. 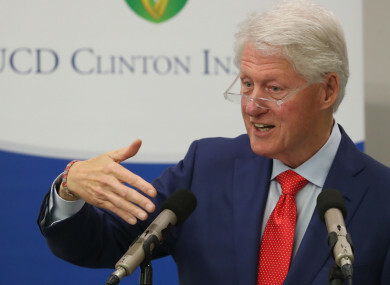 FORMER US PRESIDENT Bill Clinton has said democracy in the North will be slowly eroded away if the current political stalemate is allowed to continue. Speaking to a packed out UCD event to mark the 20th anniversary of the signing of the Good Friday Agreement, Clinton said there is a possibility of three things happening if things remain as they are. “The whole thing will fall apart and you will go back into the hell people have forgotten of the Troubles. Or, two, you can stay in purgatory, where you get denied dreams and broken hopes and you’ll just rock along, caught on a sea of lost chances. “Or three, everybody can rear back, settle down and make a new beginning. Whatever compromises have to be made to minimise the damage of Brexit, to keep the markets as open as possible, and share government,” he said. Don’t let it go. You can’t let it go by doing nothing. Clinton highlighted the success the agreement, but said it was important that people remember the past. So when Brexit happens, and then you can’t make a deal on these other things and then the government goes down, then everybody’s temptation is to double down and bargain harder. No-one is thinking about the larger politics when no-one wants to be seen to compromise, he said. But in the end, you have to be willing to give. Compromise has to become a good thing, not a dirty word. And voters have to stop punishing people who makes those compromises. And start rewarding them. Clinton spoke about the risk of allowing both political and societal “inertia” set in in the North. The further society moves on and gets away from the past, the easier it is to take good things have happened in the North for granted. The Irish peace was born out of weariness of children dying and of lost chances, the further you get away from that the easier it is to take the absence of bad for granted and to live in this purgatory where we are now. It’s a big mistake. “There is a limit to inertia, to paralysis,” he said. So my position on this is pretty certain, I basically believe that you should celebrate the 20th anniversary of the Good Friday Agreement, not for what happened but for what can happen. Reconciliation is a process, it’s not an event. “20 years ago, 17 hours late, some brave people cleared a space for the miraculous. You should fill it,” Clinton told the crowd. The threat Brexit poses to the agreement was also raised by Clinton in his speech. In the end it’s still an identity crisis, no one will drop off the face of the Earth with any of the reasonable compromises that are being discussed. However, he added that the lack of a government and the threat of Brexit was having an impact on employment and growth in the North. He warned that when there is a lack of economic growth and prosperity, tensions can grow. He said said you cannot “hem-in” human aspiration, but in turn, if it is stunted, it can turn into “human resentment”. Email “Bill Clinton warns political stalemate could result in the North going 'back into the hell of the Troubles'”. Feedback on “Bill Clinton warns political stalemate could result in the North going 'back into the hell of the Troubles'”.